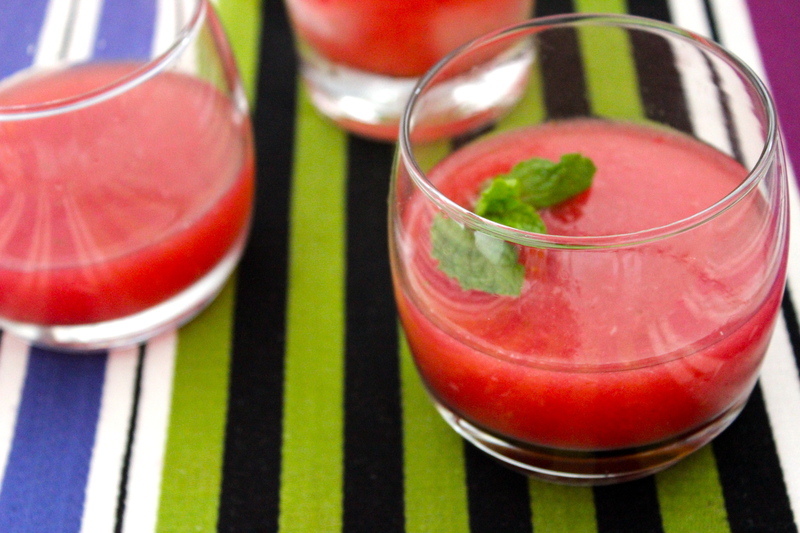 Strawberry Watermelon Cocktails…just in time for the weekend! Matt has been away on business all week so I always like to try and surprise him with something special when he arrives home. I thought that since he’s been so busy, a cocktail would be the perfect sweet treat to come home to and relax with. He’ll be the first to tell you that he’s manly enough to admit to enjoying fruity drinks. He’s been sipping on my fruity drinks for the past 5 years and realizes most often they really do taste better then the more manly counterparts. We’ve been married for over a year and a half now and he’s finally started ordering his own sweet tasting cocktail, instead of always stealing half of mine. Don’t get me wrong…he still enjoys a good beer or good glass of wine, but we both agree that nothing is more refreshing on a hot summer day than a light, crisp cocktail. I’ve never made a watermelon cocktail before, but I fell in love. I see many more Strawberry Watermelon cocktails in our future–with or without alcohol, both versions taste fabulous.